The roots of the amalgamating churches go back to the very early churches in the eastern Annapolis Valley, which included the New England Congregationalists, Scottish and Irish Presbyterians, and English Methodists. It is a history of building and demolishing churches, cooperation and unions of churches, and rebuilding again. This is not unlike our present history. On July 1, 2012, the first church service of Orchard Valley United Church was held at Evangeline Middle School. We soon moved to the former New Minas United Church building which is the current home of Orchard Valley. The Covenanter Church, a two-century-old church in Grand Pré, is part of our Pastoral Charge. It is a Provincial Heritage Property and National Historic Site. Click on the names of the churches for the histories of the amalgamating churches: Canard United Church, Greenwich United Church, New Minas United Church, St. Andrew’s United Church, and United Church of St. Paul and St. Stephen. 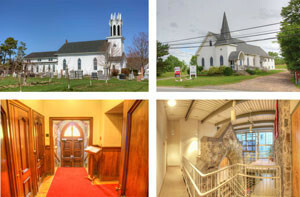 Many thanks to the Kings County Historical Society and especially photographer Paul Illsley for these wonderful photos of these four buildings which are no longer being used as United Churches.